I have had the opportunity, these past few years, to live out my burdens upon this blog. And by doing so I have received comfort and condolences from family, friends and strangers alike. When going through a hard time, some find assistance, solace and comfort, in the spoken word–oral communication. For me, the calm silence of the written word has been the soothing provision to my soul. I think we are funny, us creatures of humanity. We have so many offerings we can reach for, to guide us through whatever it is our journey presents. In fact, from the moment my son entered the hospital back in March 2011 I have been given a multitude of resources. 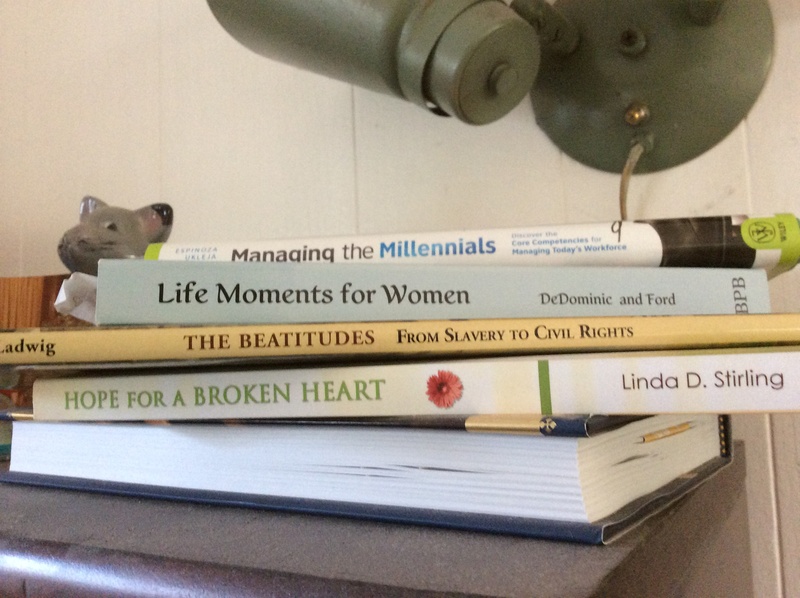 Several are grief specific and a few are literary pleasure reads. The ironic thing is that for as much as writing sends my soul to the moon and ignites within me an excitement for living, while in the pressure cooker of life (at my son’s bedside and beyond) I cannot ingest the writings of others. I can’t explain it thoroughly except to say it is as if I am using every ounce within me to live out my own story, that to take in the story of another, fiction or nonfiction, to the level a book extends, is more cumbersome to my being than helpful. Now some of my reads are soothing just by their title alone. Others not so much. Maybe from one I extract a morsel from a page, others the back cover does the trick. But all in all I am at a standstill in reading, at this time. I don’t normally keep books in such a disheveled manner as my photos suggest. But upon receiving the gift, I think my head was so clouded by grief that the idea that I am one who falls within the category of the target audience irritated me. I mean have you ever been included in a club that you had no interest in being a member? I am there. I am not interested in being a member of the “I’ve lost a child” club. No, I want him back and I want a normal family life…two children, two dogs, one husband, a house, a family, a life with grandkids down the road. 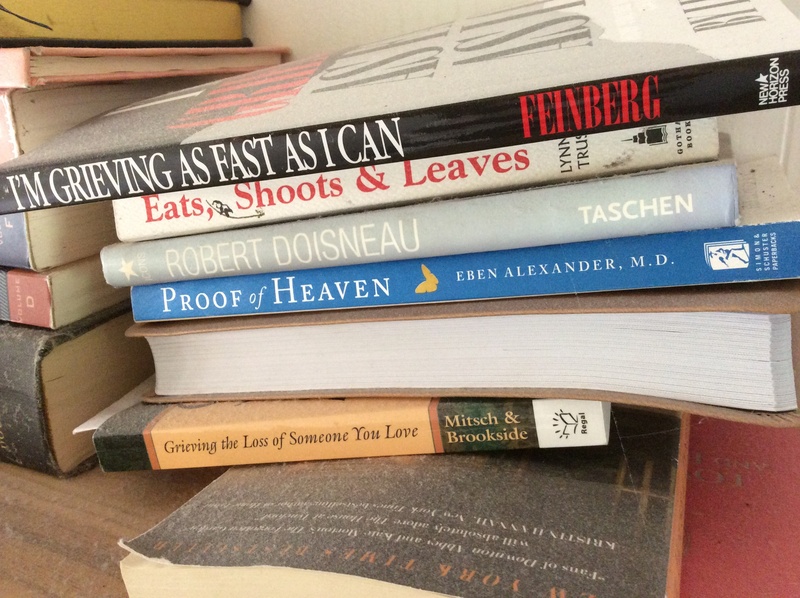 So as the books on grieving were given to me, in earnest love and attempt to soothe a difficult loss, they inadvertently served as a reminder of just that–loss. And with that word comes irritation, so I just piled them atop one another. Yet interspersed between my literary counselors are a few gems that for some reason lift the burden momentarily, if only because their placement is so out of line with the others that the irony tickles my fancy. Eats, Shoots & Leaves for example is one I have been “borrowing” now for over five years. I have read and re-read the first few chapters and can’t seem to get through to the end. But I think it is a brilliant writing as it makes punctuation the protagonist while using satirical humor to drive its cause home. As you can tell from my overuse of the comma, I am a slow learner. But the fact that this particular writing is stacked between such titles as “I’m Grieving As Fast As I Can” and “Grieving the Loss of Someone You Love” I find more soothing to my grief stricken state than if I actually pick the resource up and read it (the other little outcast on the works of Robert Doisneau is equally as comical). In the same vein, the other stack of heartfelt reads is topped by a ridiculous writing titled, “Managing the Millennials.” It is not ridiculous because it is a poorly written resource, just that its placement among the others deems it so. So here I am living between the lines. As the stacks of books suggest, I bounce between places of joy and sorrow, fear and courage, peaceful waiting and restless anxiety, all of which are bordered by the lines of loss that have defined our family. Just this summer alone our family has been touched (along with others) by the loss of a dear young friend, untimely and abrupt–just as our son. I can see her beautiful face, streaming with tears, as we hugged on the day of my son’s funeral. Now we grieve her passing as well, and hurt alongside her little girls and husband who grapple with their new void (though the youngest will likely not remember her mama). We also have news that another young soul, our neighbor and father of two wee ones, is not long for this world as his cancer is not responding to treatment. Our fervent prayers for a magical miracle remain intact and our souls (Brian and I, for we can’t bring ourselves to tell Esther) are heavy under the burden of this reality. My brother and his family are facing the cancer intrusion in the life and lungs of his mother-in-law, a vicious disease that has already claimed the life of her husband. These are hard, tough aspects of life. And yet, simultaneously upon us is the elation of new life. New adventure and the continued momentum of the living. Our family has the good fortune to celebrate a couple of expected births come next spring. Our niece came to live with us this summer (she just left to return for her senior year of college yesterday) and our family felt more whole with her here. Our daughter is getting ready to head off to her university, 2-1/2 hours from home, on August 28th. Far enough for her to experience the freedom to grow in her own direction, yet close enough that we can still be of real physical and emotional support. I am moving into my second year working within an environment that is well suited to my natural calling and Brian’s art, clothing and lifestyle is gaining consistent momentum (I am still hoping he makes me a woman of leisure this side of Heaven!). We had the pleasure of attending the wedding of a young couple this past weekend and we have another nuptial celebration coming next month. Our god-kids remain a bright spot for us (though we haven’t seen them much this summer), being participants in their lives is an honor we hold dear. So we move and groove within the space between the lines, the matrix if you will. For the borders represent our loss, the void of the one not here. And though the natural motion of the in-between forces us to touch the outer edge, as the laws of physics mandate, we bounce back to the middle because the lines are inhabited with a repellent within its system–a force which prohibits a long term stay. So on to the next, whatever the next happens to be. Books on grief will have to wait. The middle is available and its offers of joyful enthusiasm help assuage the deep pain of each margin. I believe scripture calls it, “beauty from ashes,” (Isaiah 61)–nothing new under the sun, just living between the lines. I have had a few people ask me a question of late, “So why are you having a hard time?” Or, “Why are you having a hard day?” The inquiry posed as result of my answer to the inevitable salutation, “how are you doing?” I find it quite difficult to express the why and the wherefore of my hard days, mostly because it takes a lot of energy for me to share my intimate feelings verbally (which is why this blog has been a healthy outlet for me). So yesterday when a good friend who has two healthy sons asked the “why” question, the best answer I could muster up the strength to state is, “because my son is not coming home.” A simple, yet profoundly difficult reality I am facing. Now it is said that “misery loves company”, but I have discovered this is not true for me. I am quite happy when a friend, acquaintance, or stranger cannot identify with my present lament. I gratefully acknowledge their place of ignorance with a welcomed relief. When I am presented with the consolatory “I can’t even imagine what you’re going through” catch-phrase, I joyfully reply, “That is good. You shouldn’t even try.” I wish no sorrow upon another, no loss too profound to bear, no kinship with this road upon which I trod. Bring me your babies. Celebrate with me your happiness. Invite me to your milestones. Crack a joke. Share a pastry. Brave the sorrow of my soul, and keep me tied to the beauty of the living. The other day I was in our back yard, loitering around my son’s room. It had been raining for a couple of days and I was out in-between a break in the clouds. It was cold, wet and breezy. As I stood in the gloom of the day, looking at the foliage of our back yard, a little bee perused the blooms on the Bird of Paradise. It was an improbable attempt at gaining nectar but there the little guy was, in the wet and cold, taking the brief opening of the clouds for the potential opportunity it provided. And there I was cheering him on with an audible voice, “Best of luck to you, little bee…go get ’em.” I then chuckled at myself for speaking out loud to a bee. And I wondered, does that make me crazy? The fact I talk to bees? Well I’m sure there are several people out there who could argue the status of my sanity for many more plausible reasons than insecta articulation. As for my own self assessment, I have determined that talking to bees does not make me crazy, but is rather a simple method of staying connected. Connected to life while living with sorrow. I do not need one to be kindred with my pain. I am quite happy my friend has two healthy and strong young men for her to continue to guide. My response was merely to help her gain insight into my hard day. My child is not coming home. Do me a favor and don’t let that statement sink in! Cole’s birthday is coming up on Tuesday. The Bent 3 are struggling. But since this is my personal blog and not the forum for Brian and Esther to spill their beans, I shall keep the conversation focused on myself only. I’m mad at Sigmund Freud. I don’t like “Mourning and Melancholia,” I don’t like 5 stages of grief. I don’t like any of it! I’ve actually half finished a post that is quite sentimental and beautiful, but it will have to wait because at this moment I am determined to be angry. I am mad I will never have the opportunity to be jealous of a daughter-in-law. I am bothered by the fact that I will never have my son’s wife think I am the worst parent ever and fearfully leave her children in my care. I am cut short the opportunity to compete for holidays with my son’s inlaws, this irritates me. I am mad I will never endure the better way she cooks salmon, lasagne, or pancakes. Am I angry? Yes! At this moment I am text book. Call it what you will, Freud, call it what you will. Now that I have regurgetated that from my system, I find myself creeping back to sorrow. Funny, I like anger better!